He said war was too important to be left to the generals. When he said that, 50 years ago, he might have been right. But today, war is too important to be left to politicians. They have neither the time, the training, nor the inclination for strategic thought. The American proposal of a coordinated decade growth target for the countries in the newly formed Organization for Economic Coordination and Development was controversial. The Secretary-General of the OECD, Thorkil Kristensen, the British, Canadian and Belgian delegations were skeptical. 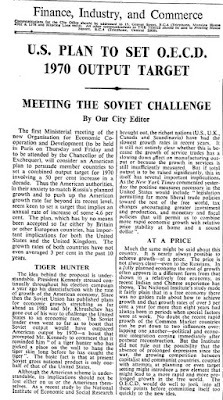 There had even been doubt raised in the U.S. Treasury Department about "the focus on GNP as a measure for progress and the propaganda value of a target below an unrealistic average growth rate of 5 percent annually" (Schmelzer, p. 175). It is interesting to note that within all the extensive discussions among OECD experts and the key economists from member countries, the idea that a distinction could be made between absolute and relative growth numbers, between the size of an increase of the economy and the rate of increase, had not been brought up. Although no one expected the US and Britain to grow at the same rate as Italy or Japan due to the possibilities for catch-up, the shared assumption was that given the right policies growth rates could be stabilized between 4 and 5 percent annually for all countries, irrespective how rich they were and how large their economies had already grown. The growth rate dominated economic policy debates in the 1960s, exponentiality was the implicit ideal, not linearity. So that is how co-ordinated growth targeting first leapt onto the world stage -- as a panacea propaganda stunt without the technical know-how for accurate forecasting, targeting or policy selection to meet the targets. By happenstance, the OECD countries came close to meeting their joint 1960s growth target. The econometric analysis and policy prescriptions came as an afterthought. In terms of enshrining the hegemony of economic growth as a policy imperative, the OECD growth targeting has to be judged a success. What that means in terms of global financial stability, the demise of the Bretton Woods system, environmental and social impacts is another question. 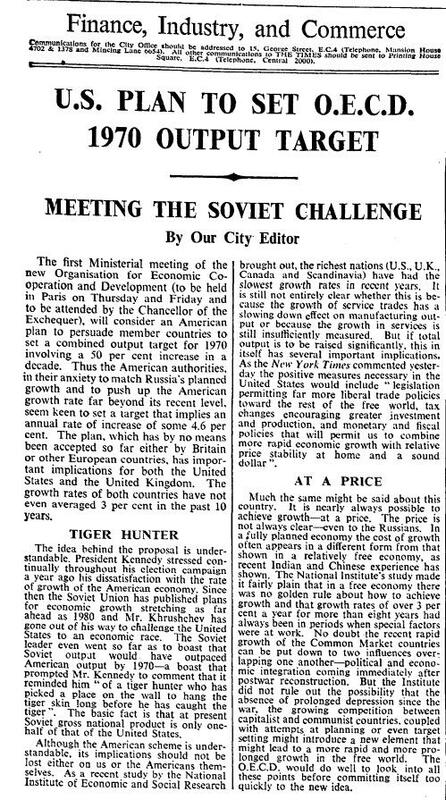 But what struck me as I was reading Schmelzer's documentary account the 1961 decision is how much the concept of greenhouse gas emissions reduction targeting mimics the American proposal for economic growth targeting. This is not a good sign. It was Lloyd George who said that phrase!! "La guerre! C’est une chose trop grave pour la confier à des militaires."